I think of a democratic and progressive India, where rights of every citizen are respected and ensured. Here is an important case law from USA wherein an American firm will end up paying $100,000 (One lac US Dollars) to settle a discrimination lawsuit filed by the U.S. Equal Employment Opportunity Commission (EEOC) on behalf of an Indian-origin employee, the agency said on July 2. Federal contractor Camber Corporation was accused of violating federal law when it denied a transfer to employee Mr. Ashok Pai based on his son's medical condition and then fired him. Such alleged behaviour violates the Americans with Disabilities Act (ADA) and the Age Discrimination in Employment Act (ADEA), the EEOC said in its suit. Besides a $100,000 award for lost wages, the two-year decree entered by U.S. District Court Judge Anthony J. Trenga to resolve the case includes injunctive relief to prevent disability and age discrimination from occurring at the company in the future. According to the EEOC, Pai's son sustained serious injuries in a car accident as a child, due to which he has been disabled for more than 25 years. Pai sought a transfer to work nearer to where his son lived and requested leave to assist with his care. However, after the management learned that Pai was seeking a transfer to take care of his son, Camber classified him as "resigned," began processing termination paperwork and ultimately fired him for pretextual reasons, the EEOC said. Pai, who was then in his mid-60s, was subsequently replaced by someone over 20 years younger than him. Camber Corporation is headquartered in Huntsville, Ala. The discrimination against Pai took place in Falls Church, Va., where he worked. The EEOC filed its suit in U.S. District Court for the Eastern District of Virginia after first attempting to reach a pre-litigation settlement through its conciliation process. "When employers violate the law, the EEOC will hold them accountable. We are pleased that the parties were able to reach a resolution to better protect the rights of employees under federal law," EEOC regional attorney Debra M. Lawrence said in a statement. "The ADA not only prohibits employers from discriminating against people with disabilities, it also bans discrimination against employees and applicants based on their association with a person with a disability - for good reasons," Washington Field Office Acting Director Mindy Weinstein said. "Mr. Pai simply asked for a transfer to help deal with his son's severe disability, and the company made a bad situation worse by punishing him for trying to do the right thing and showing age bias at the same time. The EEOC is here to fight for the rights of people like Ashok Pai." Jeeja Ghosh - is another name for perseverance and doggedness when it comes to fighting out for rights. And she has shown it once again that if you stand for what is right, perseverance pays. Jeeja, a fellow disability rights activist has been married for around five years now. Resident of Ballygunge she has broken many ceilings and has had many firsts. The 48-year-old added one more to the list last week, becoming the first person born with cerebral palsy in Kolkata — and possibly India — to become an adoptive mom. Motherhood was a dream that Jeeja, born with the disabling condition, nursed since she tied the knot in 2013. But little did she know about the hurdles she would have to face before being considered fit for adopting a five-month-old girl. 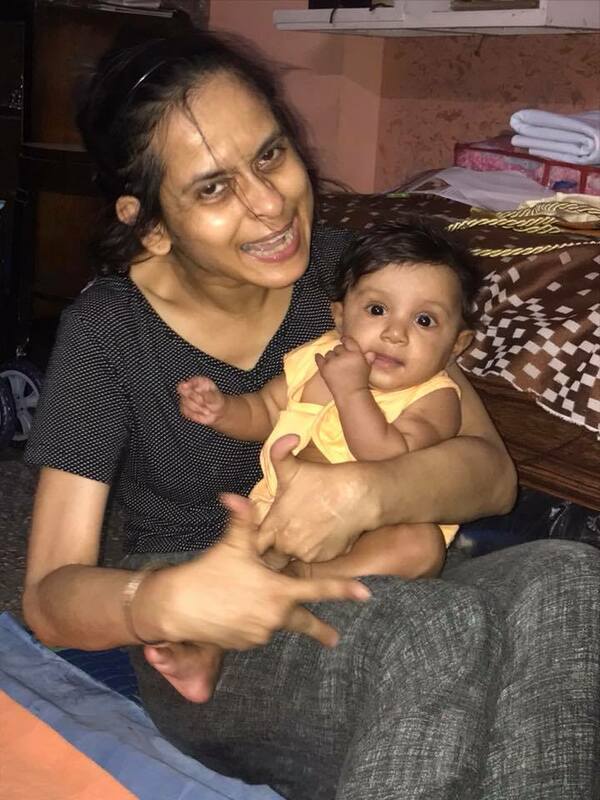 On 7th June 2018, after an epic struggle, Jeeja welcomed home a girl child — lovingly called Bhujungu and Sonai at home — to her ninth-floor flat at the Saptaparni complex on Ballygunge Circular Road. Jeeja, a Presidency College graduate and Delhi University postgraduate, and her husband, Bappaditya Nag, a law officer at Syndicate Bank, applied for adoption in 2016. Madhusmita Nayak, programme manager for the specialized adoption agency project at Keonjhar’s Self-Realisation Mission (SRM), from where the child was adopted, said the baby was born in January 2018 and was abandoned at a Keonjhar hospital. “We don’t know about her biological parents,” Nayak said. It was love at first sight for the couple when they saw the yet-unnamed child at SRM. But it needed multiple trips to Keonjhar to convince the adoption committee that Jeeja could be a responsible care-giver. “We submitted a fit certificate from a gynecologist but even after that the committee told us this certificate was not acceptable because it had to be issued by a ‘medical practitioner’,” Nag said. It was an uphill struggle since then and, after numerous mails and reminders, the couple finally escalated the matter to Dr Sadaf Nazneen, consultant (eastern region), Central Adoption Resource Authority (CARA). Jeeja Ghosh and her husband, however, do not buy this argument. “I felt so humiliated with the questions they asked. The district child protection officer described cerebral palsy as a ‘mental disease’ and expressed apprehensions about my communication skills. I fail to understand how someone in that position can have such ideas,” Ghosh alleged. TOI spoke to the officer, Debangana Barik, who said she “did not want to hurt” Ghosh at all. “My language issue might have created a problem. I am very impressed with her personality and she is completely fit to take care of the baby. Her adoption case is a success story for all of us here,” Barik added. But the new parents’ legal work is still not over. Bhujungu is, legally, in Ghosh’s and Nag’s foster care right now. “We are going to file a court application in Keonjhar soon and, within 60 days of that, we expect to get the order that will make us her legal parents,” Ghosh said. The Saptaparni flat has undergone a sea change, with nappies, oil cloth and feeding bottles strewn all over the drawing room. Both parents are on leave now. Bhujungu has a twinkle in her eyes when Jeeja rocks the pram. She tilts her head and then lazily rests her little toes on the pram handle. Friends and relatives are dropping by regularly with cartloads of gifts for the little one. Nag, too, is a complete hands-on father, from feeding Bhujungu to cleaning her when she soils herself. Ghosh’s octogenarian mother, a dementia patient, is thrilled. Seated in a wheelchair close to the pram, she intermittently utters the baby’s name aloud. On rare occasions, when memory serves her right, seeing Ghosh and her daughter is a reminder for the old lady of her own motherhood tales of fighting against odds to bring up a daughter. Jeeeja's successful adoption of a child has set a benchmark and given hope to several persons with disabilities that they, too, can become parents. In a welcome initiative, the Finance Ministry has, in compliance with Section 40 & 44 of the Rights of Persons with Disabilities Act 2016, which are reproduced below, made it mandatory for all new projects to include accessibility features in the costing of the total project cost when proposals are sent for expenditure finance committee approvals. No funds will be release for projects that don't include accessibility components. "40. Accessibility.—The Central Government shall, in consultation with the Chief Commissioner, formulate rules for persons with disabilities laying down the standards of accessibility for the physical environment, transportation, information and communications, including appropriate technologies and systems, and other facilities and services provided to the public in urban and rural areas. 44. Mandatory observance of accessibility norms.—(1) No establishment shall be granted permission to build any structure if the building plan does not adhere to the rules formulated by the Central Government under section 40. (2) No establishment shall be issued a certificate of completion or allowed to take occupation of a building unless it has adhered to the rules formulated by the Central Government"
The department of expenditure has directed all ministries to include “special measures proposed to meet needs of persons with disabilities, including accessibility requirements under the Right of Persons with Disabilities Act” in new construction projects. The measures would be included in all inter-ministerial consultation notes and in the final expenditure finance committee (EFC) note. In the format of EFC notes for appraisal of schemes, the department of expenditure amended its earlier guidelines to include an additional para. This comes into immediate effect. The ministries/ departments are requested to accordingly circulate EFC memos for inter-ministerial consultations after incorporating measures to meet needs of persons with disabilities,” the amended guideline directed. The department of empowerment of persons with disabilities (DEPwD) has been pushing for this inclusion for some time. Speaking to ET, DEPwD joint secretary Dolly Chakraborty said, “Any new construction project – like a flyover where pedestrian crossings are being planned or overbridges or a new government building – would now have in-built accessibility features. Harmonised guidelines have been issued to have common features. Now it would be mandatory to include these within the planning stage.” .. This, Chakraborty said, would help to make physical environment more accessible as retrofitting later has always been a financial and design challenge. Submissions made to the Telecom Regulatory Authority of India seek stringent, legally-binding provisions covering all players in the sector. New Delhi: Disability rights activists have called for a stringent policy to ensure persons with disabilities are able to access with ease both the software and hardware when it comes using information and communication technology (ICT). With the Telecom Regulatory Authority of India (TRAI) issuing a consultation paper on ‘Making ICT Accessible for Persons with Disabilities (PwDs)’ on December 20, 2017, and seeking comments from the stakeholders by January 22, 2018, a number of disability rights groups have made their submissions. “For achieving a truly inclusive information society, persons with disabilities must be able to use information and communication technologies (ICTs) with equal ease. This can be made possible only if the accessibility of ICTs is on the top of the agenda of manufacturers and service providers. Though it makes business sense to attract persons with disabilities with ICTs having accessibility features, manufacturers failed to tap this opportunity. Hence, a stringent policy is required to ensure persons with disabilities get what they need,” said noted disability rights activist and director of Svayam, Subhash Chandra Vashishth. Incidentally, the World Bank Report (2007) titled ‘People with disabilities in India: from commitments to outcomes’ had stated that “there is growing evidence that people with disabilities comprise between 4 and 8 percent of the Indian population”. Further, the population of senior citizens in the country ranges between 10-12%. Put together, these aspects raise the need for making ICT inclusive for improving the quality of life of the PwDs. In its submission to TRAI, Svayam has noted that often the websites, software and mobile apps from vendors and service providers do not comply with accessibility guidelines. This makes them inaccessible for visually impaired persons who make use of assistive technologies like screen reading software, braille displays, etc. It has also pointed out that “most electronic hardware products like Set-Top-Box (STB), smart home solutions, etc. are not usable for persons with disabilities as they don’t comply with international accessibility standards e.g. the buttons on most of these devices do not possess any tactile notations and audio feedback to allow visually impaired users to interact with them. Most policies are simple guidelines and often lack appropriate budgetary or funding support for implementation and penalty for non-adherence. This leads to lesser efforts towards compliance, the organisation noted. Stating that “a comprehensive plan is needed to adopt an accessible operating system for product development and service divisions to include everyone,” Vashishth said issuing of the consultation paper was a step in the right direction. As for telecom regulator TRAI, he said, it has highlighted in the paper that an equal and inclusive society involves providing equal opportunities to all sections of society irrespective of their physical, economic, social or religious identity in all spheres of life and this covers education, skill development, economic empowerment and ensuring full participation of all persons including PwDs. While programmes such as ‘Digital India’ envisage inclusive growth and a digitally empowered society, the benefits of ICT have not reached all the sections so far. At a time when mobile phones are also being used to access information, avail of various services, the need of the hour is promoting digital inclusion for enabling PwDs to lead independent and dignified lives. With the new Rights of Persons with Disabilities Act, 2016 raising the disability categories from seven to 21, “this presents an opportunity for all the stakeholders (disability/accessibility activists, NGOs, etc.) to mull over the concern areas and help the government on how to make ICT accessible for persons with disabilities,” said Vashishth. On the key areas of concern, Svayam has noted among other things that there is an absence of periodic stakeholder coordination; lack of harmony between policies and the regulation across the world to adhere to uniform standards; lack of research and development, lack of aggressive campaigning for accessible ICTs, lack of direct involvement of PwDs in product development; high cost of specialised assistive technology; high import taxes and no subsidy or incentives being provided to the manufacturers from the government. It has, therefore, suggested that “all establishments” should be covered by all the provisions in the policies concerning access to PwDs; the provisions should be made “mandatory” and legally binding instead of remaining mere guidelines; clauses specifying substantial penalties for non-adherence should be incorporated; definition of “everyday use products” should be clearly defined and detailed to cover products used for personal use, at home, office and in public infrastructure. With India being culturally and linguistically diverse, the organisation has also demanded that ICT services in regional language be started for wider reach as at present most of the assistive technology and software is not available in them. It has also called for funding “futuristic technologies”. “Recently, Microsoft was granted a patent for a brain control device that can give users mind control powers to operate apps with just their brains, without any movement. Using sensor-equipped head bands, the device could ideally interpret neurological data to have users open and use apps with thoughts instead of gestures,” it pointed out. NEW DELHI: People with disabilities won't have to face lengthy and "humiliating" security checks at airports anymore, with the Central Industrial Security Force issuing guidelines on how to scan passengers on wheelchairs and those wearing prosthetics. While earlier, PWDs were required to go through an X-ray screening, now checking with a hand-held explosive trace detector (ETD) device will suffice. Passengers will be asked to go through an X-ray screening only if there is "sufficient doubt". In addition, they won't have to remove their prosthetic limbs for security check. The decision came after a meeting was held on Wednesday between officials of CISF, the airport sector, BCAS and the ministry of civil aviation and representatives of NGOs working for PWD rights. Earlier, a committee had been constituted to review the security-check process based on BCAS provisions to make it more "friendly" for PWDs. Officials said standard operating procedures would soon be formulated, which will be used across all 59 airports under CISF. "All issues were addressed at the meeting, following which it was decided to tweak the system of frisking of such passengers. Now, a visual inspection and an ETD hand-held device scanning will suffice while wheelchair-bound passengers will also get relief," said O P Singh, CISF DG. CISF officials said the screening officer would also be required to make an entry into a register each time he subjected a PWD passenger to an X-ray screening, stating the reason for doing so. "We are looking at any technological aid that can further make this process easier. CISF personnel at all 59 airports will now be trained and sensitized according to the new procedures," Singh added. Disability rights activists welcomed the move, saying it was long overdue. "It's humiliating to get off the wheelchair and remove prosthetics for scanning. More people will look forward to flying again," said Javed Abidi, director, National Centre for Promotion of Employment for Disabled People. Suvarna Raj, a wheelchair-bound para-athlete who has often faced inconvenience at airports, said the move would lead to greater accountability. In a major relief to the disabled, the CISF will no longer carry out the "humiliating" airport security drill of asking people with disabilities (PWDs) to remove their prosthetics or make them get up from their wheelchair for screening at the airports. The announcement was made by the CISF Director General OP Singh. The DG said that the Central Industrial Security Force will now use explosive trace detectors (ETDs) and visual profiling to meet the security needs. The Force will also conduct a country-wide survey to find out how many such passengers travel by air each day. "The aim is to ensure that such passengers do not face any humiliation or uneasiness when they travel through Indian airports. We have seen numerous complaints in this regard. What we have decided now is to use explosive trace detectors and the visual profiling method of the passenger and his prosthetic tool or wheelchair rather than asking them to take out everything," Singh said. The current procedure is to ask passengers to take off their prosthetics before boarding a flight and ask to get up from those on a wheelchair. "We are soon going to issue a fresh list of standard operating procedures (SOPs) to usher the new regime in a uniform manner," the DG said. "We will also conduct a survey at all the 59 airports that we guard to see how many such PWD passengers we receive on an average. That will give us a fair idea as to how to go about implementing the new SOPs." A senior official in the CISF airport sector said they have estimated that about eight-10 such passengers use Delhi's Indira Gandhi International Airport (IGIA) every day, the busiest airport in the country. "Passengers with prosthetics will be asked to remove them only under compelling circumstances which will be purely security concerns. The same procedure will be adopted for wheelchair-bound passengers and those with other disabilities," the official said. The director general added that CISF was also looking at "simplifying the security procedures for passengers with orthopaedic issues." In case of prosthetics with foam padding, he said, CISF personnel will use new SOPs but can seek its removal, keeping in mind security concerns. Disability rights activist Javed Abidi, who attended a recent meeting with the CISF authorities on the subject, raised his concerns during a recent conversation. "I have travelled across the globe for so many years now but only at an Indian airport do I have to get down from my wheelchair so that the security personnel on duty can put it inside a large X-Ray machine to check it against explosives and other hazardous material that can be a threat to the aircraft or aviation security," Abidi, the convener of the Disabled Rights Group, said. It is very difficult and embarrassing, he said, for people who have prosthetic or artificial limbs to take out the entire part in full public view inside an airport. The CISF is the central paramilitary force tasked with guarding 59 civil airports in the country. The developments assume significance as in the past, several persons with disabilities have suffered humiliation at the hands of security or airlines staff at airports across India. New Delhi: The long fight of disability rights activists for making air travel more friendly and sensitive towards the needs of persons with disability (PwD) appears to have finally borne some fruit. The Bureau of Civil Aviation and Security (BCAS) has accepted the recommendations of the Central Industrial Security Force (CISF) to use X-ray scanning for prosthetics and orthotics only as a measure of the last resort. Instructions have also been issued to make wheelchair users get up from their chairs only in exceptional cases for security checks. The decision was made known at a meeting convened by director general of the CISF, O.P. Singh, on October 11, which had representatives of the BCAS, Ministry of Civil Aviation, the Air Passengers Association of India and representatives of the disability sector. The meeting, which lasted close to 90 minutes, was attended by top members of the CISF along with its senior officers deployed at the airports. Among those present in the meeting were Javed Abidi, director of the National Centre for Promotion of Employment for Disabled People (NCPEDP), cyclist Aditya Mehta, Subhash Chandra Vashishth, Rajesh Bhatia, Nipun Malhotra and associate professor of physiology at the University College of Medical Sciences, Delhi, Satendra Singh. The developments assume significance as in the past, several PwDs have suffered humiliation at the hands of security or airlines staff at airports across India. In 2013, above-knee amputee and marketing professional Suranjana Ghosh Aikara was made to take off her prosthetic leg for a scan at both Delhi and Mumbai airports. Anjlee Agarwal of the Samarthyam National Centre for Accessible Environments, who suffers from muscular dystrophy, faced two odd situations in early 2012; first, when she was bodily lifted by male porters and the other, when she was carted around on a luggage trolley. Her experience made her seek more dignified travel for PwD travellers.. In 2012, Jeeja Ghosh, a teacher at the Indian Institute for Cerebral Palsy in Kolkata, was made to deplane because the staff found her to be ‘abnormal’. Following her appeal, the Supreme Court constituted a committee and directed the DGCA and the BCAS to consult with disabled section of India’s population. However, according to Singh, despite directions by the apex court, the BCAS continues to evade this directive. However, Singh lauded the role being played by the CISF, saying it continued to “remain receptive”. Singh also noted that the BCAS had chosen to remain absent from the high-level meeting chaired by the director general of the DGCA with the Airports Authority of India, all the airlines and the disability sector on April 7 this year. However, Abidi appreciated the change in the approach of both the CISF and the BCAS towards the issue. “There has been a lot of discussion and exchange of notes between the CISF and BCAS of late. It was a well-rounded meeting, almost a closure type, and I was impressed by the seriousness of purpose. It was called to problem-solve and to bring about a change,” he said. Stating that the CISF has already sent its recommendations to the BCAS and that the latter had constituted a committee which held its meeting a few days ago, Abidi said that the CISF had only invited one user of prosthetics and another from the wheelchair lobby from the diverse disability sector. “So the focus was more on prosthetics and the concerns of the wheelchair users”, he said. As for other categories of PwDs, he said, they too suffer problems but these are not related to security and need to be handled by the civil aviation ministry and other agencies. “The visually impaired are facing a big problem these days since all the airports have been made sound-free and therefore, the announcement of change of gate for departure of flight is not made through loudspeakers. So a blind person is unable to know that the gate has been changed,” Abidi said. “Similarly, persons with speech impairment find it difficult to tell their preferences to the airlines staff or about food preference to the air-stewards,” he added. Acknowledging that the users of prosthetics, orthotics and wheelchairs remain among the worst affected, Abidi said that the new developments are very positive. “Broadly, it has been decided that in the case of wheelchair users, X-ray should be the last option. The standard practice globally was to profile the passengers, frisk them, make them go through the explosive trace detectors (ETD) if need be and to send their gadgets for X-rays if there was greater suspicion,” he said. “The world over, X-ray is rarest of rare and in all my travels abroad, even to the US in the post 9/11 era, never have I been asked to get off my wheelchair. However, in Indian airports, it is a norm”, Abidi said. Moreover, he lamented, unlike airports abroad, the CISF personnel have been following the norm of making wheelchair users get off their chairs as part of the security drill. So what is rarest of rare the world over, is their preferred norm here,” he added. The rights activist is hopeful that meaningful changes are being effected. He pointed out how the CISF recently undertook a full training programme for its personnel to sensitise them towards autism. The programme was conducted in association with Merry Barua’s organisation, Action for Autism. “It had sensitised the CISF personnel about the behaviour and concerns of passengers suffering from autism and how they were like to react in different situations“, Abidi said. Observing that many schools were not following the rule, Jaiprakash Chaturvedi, Deputy Secretary (Affiliation), said in a recent circular, “The management and the head of CBSE-affiliated schools are hereby directed to strictly follow the provisions and arrange to appoint special educators in schools.” He added that the schools will have to inform their managing committees about the provision for stricter compliance. But Mumbai schools have expressed that it was difficult to meet this condition. DAV School, New Panvel, has been advertising for a special educator for the last two years, but did not find any qualified professionals. “We have been trying to hire a special educator since 2015. This year, we advertised twice but still did not get anyone good,” said Jayashree Khandekar, principal of the school. Some city schools are using counsellors in place of special educators or hiring them part-time. “We are unable to find full-time special educators, so our counsellor helps in remediation,” said Deepshika Srivastava. She added that although teachers have been sensitized in identifying students with learning disability, they could not pay individual attention to all because there were 40 to 50 students in each class. Ever since the enactment of the Rights of Persons with Disabilities Act 2016, particularly after it was brought in to effect on 19th April, 2017, lot of concerns have been raised by the stakeholders, various High Courts and the Supreme Court of India as to how the existing policy framework will be tuned to the requirements of the new Act. The pace has been very slow warranting the courts to issue directives. After the new Act, several new disabilities have been added in to the list who could now claim rights of reservations in jobs and reasonable accommodations for them to be able to perform jobs on an equal basis with others. The DoPT, which is cadre controlling authority for central civil services and other allied services has put out a notice dated 20 June 2017 seeking suggestions on the comprehensive memorandum on implementing reservations for persons with disabilities. The undersigned is directed to enclose a copy of draft instructions bringing them in line with THE RIGHTS OF PERSONS WITH DISABILITIES ACT, 2016' with regard to reservation for Persons with Benchmark Disabilities in the posts/services Under the Central Government. With the notification of ‘THE RIGHTS OF PERSONS WITH DISABILITIES ACT, 2016’ on 28th December, 2016, which took effect from 19th day of April, 2017, the following instructions are issued in line with the provisions made in this Act regarding reservation for Persons with Benchmark Disabilities in the posts/services of the Central Government. Notwithstanding anything contained in the earlier instructions issued so far on the subject, the following instructions shall prevail in case of any contradiction with previous instructions issued so far. The nomenclature used for any job/ post shall mean and include nomenclature used for other comparable jobs/posts having identical functions. If a post is identified suitable only for one category of benchmark disability, reservation in that post shall be given to that category of persons with that benchmark disability only. Reservation of 4% shall not be reduced in such cases and total reservation in the post will be given to persons suffering from that benchmark disability for which it has been identified. Likewise in case the post is identified suitable for two or more categories of benchmark disabilities, —reservation shall be distributed between persons with those categories of benchmark disabilities equally, as far as possible. It shall, however, be ensured that reservation in different posts in the establishment is distributed in such a way that the persons of all categories of benchmark disabilities, as far as possible, get representation to the posts identified for them. (e) “acid attack victims” means a person disfigured due to violent assaults by throwing of acid or similar corrosive substance. 9. DEGREE OF DISABILITY FOR RESERVATION: Only “person with benchmark disability” would be eligible for reservation in posts/services with not less than forty per cent of a specified disability where specified disability has not been defined in measurable terms and includes a person with disability where specified disability has been defined in measurable terms, as certified by the certifying authority. A person who wants to avail of benefit of reservation will have to submit a Disability Certificate issued by a Competent Authority. 12. At the time of initial appointment and promotion against a vacancy reserved for persons with benchmark disabilities, the appointing authority shall ensure that the candidate is eligible to get the benefit of reservation. 14. Reservation for persons with benchmark disabilities in Group ‘A’ or Group ‘B’ posts shall be computed on the basis of total number of vacancies occurring in direct recruitment quota in the cadre in all the Group A posts or Group ‘B’ posts respectively, and the computation of total vacancies shall include vacancies arising in the identified and non-identified posts. (a) Every Government establishment shall maintain separate 100 point vacancy based reservation roster registers in the format given in Annexure A for determining/effecting reservation for the Persons with Benchmark Disabilities – one each for Group ‘A’ posts filled by direct recruitment, Group ‘B’ posts filled by direct recruitment, Group ‘C’ posts filled by direct recruitment, Group ‘C’ posts filled by promotion, Group ‘D’ posts filled by direct recruitment and Group ‘D’ posts filled by promotion. 17. In order to ensure that cases of lapse of reservation are kept to the minimum, any recruitment of the disabled candidates shall first be counted against the additional quota brought forward from previous years, if any, in their chronological order. If candidates are not available for all the vacancies, the older carried forward reservation would be filled first and the current vacancies would be carried forward if not filled up. 20. Since the persons with benchmark disabilities have to be placed in the appropriate category viz. SC/ST/OBC/General in the roster meant for reservation of SCs/STs/OBCs, the application form for the post should require the candidates applying under the quota reserved for persons with benchmark disabilities to indicate whether they belong to SC/ST/OBC or General category. (ii) An employer of the Government establishment shall furnish to the concerned special employment exchange, the result of the selection within fifteen days from the date of selection. 35. All the Ministries/Departments are requested to bring the above instructions to the notice of all appointing authorities under their control.